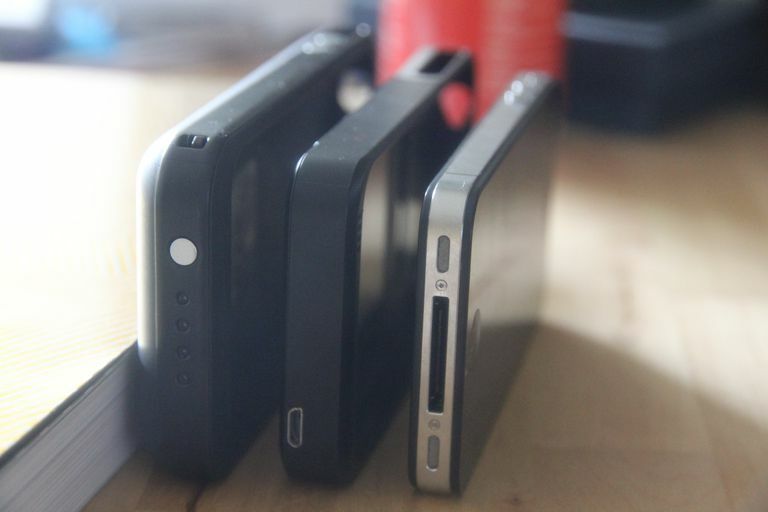 From left to right - Mophie Juice Pack Plus, iCarte 420A and iPhone 4. The mophie Juice Pack Plus is among the more expensive iPhone extended batteries, but its combination of comfortable design and high-capacity battery justifies the price. The mophie Juice Pack Plus is the latest installment in mophie's successful Juice Pack line of iPhone extended battery packs. The Juice Pack Plus further refines the line by getting a little slimmer and lighter, while also increasing the battery capacity. IPhone users who are always on the go and regularly face dead batteries will want to strongly consider the Juice Pack Plus. Like its predecessors and competitors like Kensington's PowerGuard, the Juice Pack Plus is both a case and extended life battery. You seat the iPhone in it by removing the small top piece of the case, sliding the iPhone in, and then snapping the piece back in place. Once inside, the iPhone and Juice Pack Plus can both be charged via the included USB cable. The iPhone can also be synced without removing it from the case. As has become common on extended life battery packs, the Juice Pack Plus sports an on/off switch that allows you to control when it recharges the iPhone's battery. This allows you to charge the iPhone only when needed, rather than constantly as the battery is drained. In my testing, the Juice Pack Plus supplied roughly 100% additional battery life to the iPhone. How much use time this translates to will depend on how you use your iPhone. Still, that's like getting an entire extra battery for your phone—pretty nice. As a case, the Juice Pack Plus is solid. It allows access to most of the iPhone's buttons (volume and hold have additional buttons laid over them to make them usable through the thick case), though the ringer button can be a little hard to reach. Many extended life batteries for the iPhone face the problem of weighing additional battery life against being too bulky. The Juice Pack Plus adds 2.5 ounces to the weight of the phone and 0.71 inches of thickness. While these are certainly increases (it's actually slightly heavier and wider than the Kensington PowerGuard, even though that product feels bigger) and it would be nice to see these reduced in future revisions, the case never feels too bulky in a pants pocket. The Juice Pack Plus's features are compelling. The thing that will probably give users pause is its price. At $100, it costs nearly double competitors like the Kensington PowerGuard. The PowerGuard offers about 50% less battery capacity, though, and the Juice Pack's Plus design is superior. Given that, we'd probably spend the extra money.